Jason Goodwin began his career with LifeNet in 2000. He started as a volunteer firefighter in 1997 with the Salem Volunteer Fire Department and the Sherwood Volunteer Fire Department in Arkansas, and the Nash Fire Department in Texas. Jason received his paramedic certification in 1998. 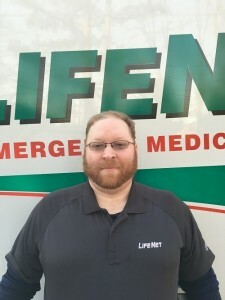 Jason works in the Texarkana division of LifeNet and takes on the additional responsibility of the ambulance equipment layout for the Texarkana fleet. He is highly respected for his commitment to and concern for his patients. He is the first to volunteer for a task and this is shown through his pride and love of EMS every day. To give back to the Texarkana community, Jason works alongside his wife in the animal rescue service she started in 2013. When time allows, his hobbies include working on cars, target shooting, and playing video games.